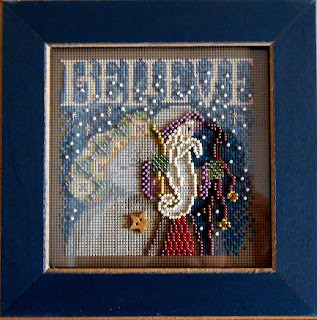 A window into my cross-stitch world...little projects, big projects...all my grown-up coloring, with thread. I started this piece before Thanksgiving, thinking I'd have it done in time for Christmas. Well, best laid plans and all that, it is *finally* done. "Believe," a Mill Hill Buttons and Beads kit and frame. Content copyright ~DKBB~. Awesome Inc. theme. Theme images by molotovcoketail. Powered by Blogger.